HOUSTON, Texas  Members of the Texas National Guard currently in training at Camp Swift, near Austin, have been told to stand by for a personal briefing from Texas Governor Rick Perry. 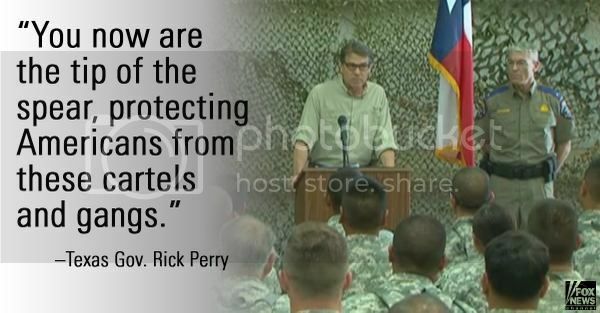 Perry is expected to arrive at Camp Swift this morning to brief the troops on his expectations of their deployment. It is still not clear as to exactly where this first batch of troops will be deployed, according to one of the soldiers currently at Camp Swift. The soldier has been at the camp receiving training this week and expects to be deployed somewhere along the border this weekend. Approximately 300 soldiers are in this particular training group. He also revealed the soldiers will be traveling and patrolling in military vehicles. The first group of soldiers who were trained last week have been ordered to remain at Camp Swift to train the following waves of soldiers. They will remain at Swift for two months. The soldiers are also being trained in the use of advanced surveillance systems such as the Ratheon LRAS (Long Range Advanced Scout) systems. These systems can be used to detect illegal crossings of the border, but also to search for people being smuggled through ranch lands to avoid border patrol checkpoints like the one in Falfurrias. Public Information Officers from both the Texas Department of Public Safety (DPS) and the Texas National Guard have been extremely tight lipped about releasing any information regarding the deployment. The soldiers are expected to begin their deployment along the border this weekend. Sounds pretty darned Presidential to me. Curious to find out what the ROE is going to be for these troops. Are they going to have to sit and take pot shots that will likely head their way? What?? He’s not going golfing? Very good news! I hope they are effective at reducing illegal entry. Thank you for the update, Jim. If the mission is that stupid “observation mission” then this is worse than useless, just being a ploy to look like he’s doing something. A real mission would involve military force to close the border... this means authorization of deadly force. Although, I had high hopes and did support him as the best in the field last time, I probably won’t support Perry in the next primary...as I think we can find a better campaigner and stronger conservative. Of course that depends who else runs. That said, you are correct, he’s acting like a chief executive should act, and would definitely be a worthy of the office. He’s really good on some issues, so-so on others, and a little too crony connected than I’d prefer. He still has shown the way in creating a strong economic environment and an incredible job creation engine. That should not be overlooked. He has the template that just might attract a lot of voters in 2016. From what I've heard it's an "observation" mission — which means they might not even be issued ammunition. Even if they are issued ammo, it's quite possible that they'll have do not open fire orders. >> If the mission is that stupid observation mission then this is worse than useless, just being a ploy to look like hes doing something. Man have you got that right. No kidding! And why all the delay in getting them there? When LA rioted, the NG was there almost immediately. I don’t think much of Perry, he’s just milking this issue for his own political purposes. Not on my list of people that I would vote for for President. He’s not really a decisive leader, but then are there any today? "Due to what he called the federal governments abdication of responsibility, he said that aside from the unaccompanied children, drug smugglers and traffickers have seeped through a porous border, spreading their tentacles of crime and fear throughout the United States." No ammo... that would be profoundly stupid. How do you (not you personally) expect people will react when one of the guardsmen is shot/killed and word gets out he was unable to defend himself because no ammo was issued? Bloody hel is what will happen. They will be unarmed, their job is only to observe. A big waste of tax dollars. I'm more than a little suspicious that he is an open borders politician, simply looking at his actions it appears all he's doing is putting up the appearance of doing something so that those who aren't open borders won't evict his arse in future political arenas. I didn't see that in the article. Got another source?